Washington’s Marcin Gortat and Oklahoma City’s Russell Westbrook were named NBA Eastern and Western Conference Players of the Week, respectively, for games played Monday, Dec. 21 through Sunday, Dec. 27. Sioux Falls guard DeAndre Liggins was named NBA Development League Performer of the Week for games played Monday, Dec. 21 through Sunday, Dec. 27. Memphis Grizzlies forward Matt Barnes has been suspended for two games without pay for engaging in a physical altercation with and threatening New York Knicks head coach Derek Fisher. Tonight’s game between the Erie BayHawks and Texas Legends, set for 7 p.m. ET at the Erie Insurance Arena, has been rescheduled due to weather-related travel delays that prevented the Legends from flying to Erie. The Lakers’ Kobe Bryant is the leading vote-getter in the first returns of NBA All-Star Voting 2016 presented by Verizon. Everytown for Gun Safety Support Fund joined with the NBA and Spike Lee to launch ‘End Gun Violence,’ a campaign focusing on the 88 Americans who are killed with guns every day and the hundreds more who are injured. 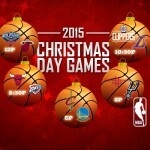 The NBA plays games on Christmas Day for the 68th time in league history. Five games will be televised in 215 countries in more than 40 languages on Friday. 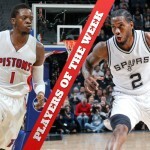 Detroit’s Reggie Jackson and San Antonio’s Kawhi Leonard were named NBA Eastern and Western Conference Players of the Week, respectively, for games played Monday, Dec. 14 through Sunday, Dec. 20. Pacers forward Paul George has been fined $35,000 for public criticism of officiating and using profanity in a live television interview. Houston Rockets’ guard Ty Lawson has been suspended for two games without pay for driving while ability impaired, in violation of the law of the State of Colorado.